A 5 inch lightweight, touchscreen LCD monitor and handles with built-in 500ft HD wireless receiver. The Small HD Focus Bolt Sidekick RX features a 5-inch daylight viewable touchscreen with built-in Teradek receiver and is compatible with FOCUS Bolt TX and Teradek Bolt 500,1000, and 3000 transmitters. This lightweight and compact monitor comes with detachable handles and removable strap for ease of use while on location. With a daylight viewable 800 nit display and anti glare screen protector means this montor is sharp enough to achieve focus and bright enough to be used outdoors. 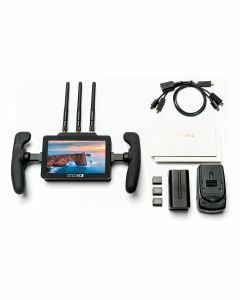 The Focus Bolt Sidekick RX comes equiped with a micro HDMI and full HDMI adapter, two USB ports- one USB on each side of the keyboard for connecting external hard drives or wired mouse, plus an L-Series Battery Kit.